Designed by artist Larisa Kovalass-Kovalevska on the theme of Latvian folk epic Lāčplēsis. The designs are based on authentic, verifiable museum artefacts of clothing and decorations. Right: packs contain 56 cards (52 + 2 jokers + 2 blank) and the first edition was limited to 500 packs. The cards are manufactured in the so-called American Poker size. Anglo-American corner indices are used. The cards appeared in June 2003, just before the 23rd Latvian Folk Song Festival. 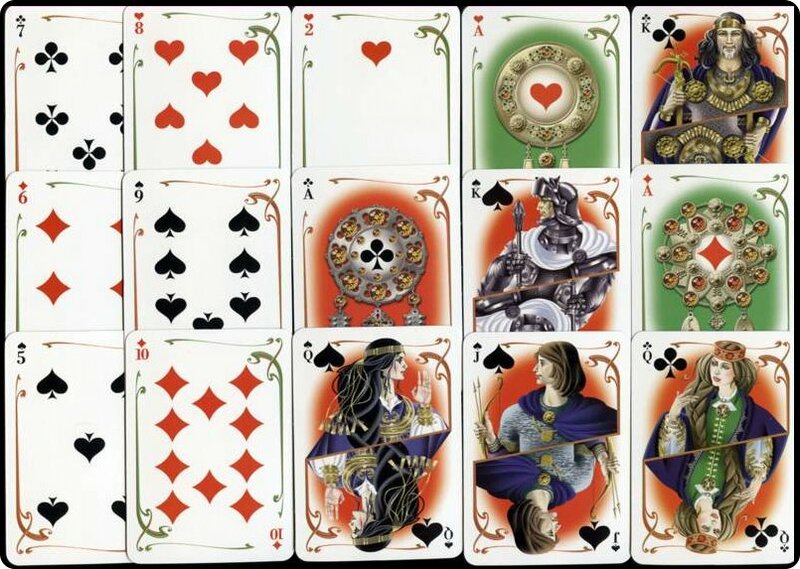 References: Latvian Playing Cards by Jānis Mētra, Riga, 2006.